The City of Sugar Hill has named the 2018-2019 Youth Council members. Five of the Youth Council members, Laura Ann Acker (Youth Mayor), Camryn Flores (Youth Mayor Pro Tem), Nida Merchant, Bhaumi Shah and Camden Doker are returning candidates from the previous school year. The three remaining positions were awarded to Khushi Mehta, Hyunwoo (Daniel) Park, and Alexis (Lexi) Ducote. These high school students will represent the city for the duration of the school year. This is the fifth year for the Youth Council program. The program has grown into a thriving group of Sugar Hill high school students who are truly making a difference in their community. 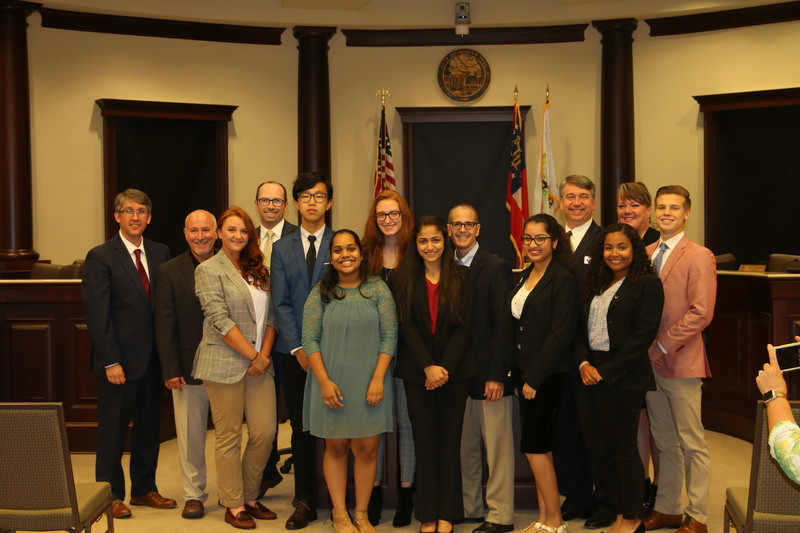 Their accomplishments include the creation of a middle school education event during Georgia Cities Week and creating of a group of teens (Youth Ambassadors) who focus on volunteer work in and around the community. Because of these and several other efforts, the group has been recognized as the example of Youth Councils around the state. The Sugar Hill Youth Council was sworn in by Mayor Steve Edwards at the City Council meeting on September 10, 2018.